What are They Spraying in The Sky? Is it a chemtrail or a contrail? 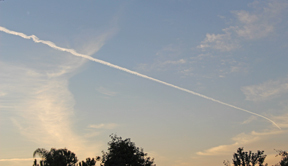 This jet trail joins many other artificial clouds adrift over Sacramento County in September, 2015. According to patents and soil testing, these clouds are packing aluminum and heavy metals that contaminate our breathing air and biosphere. 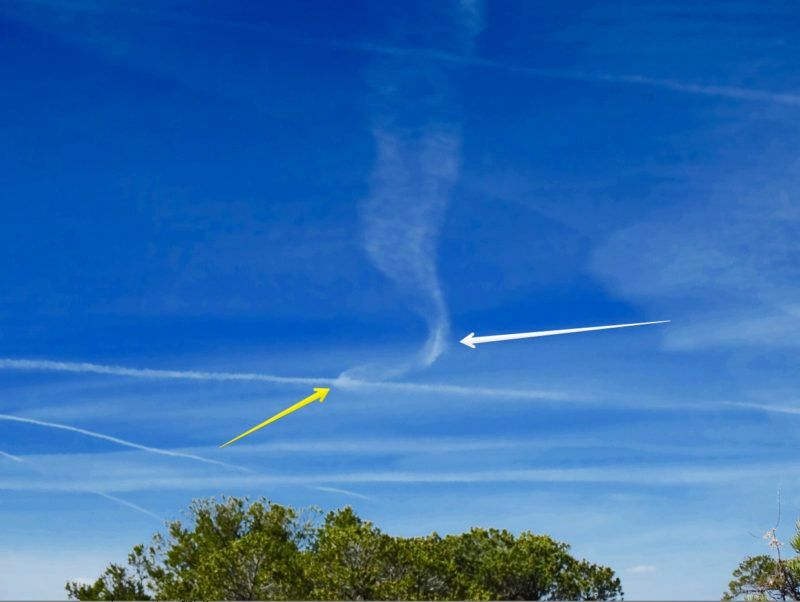 May 22, 2018 -- First widely reported in 1998, jet-dispersed aerosols now daily fill our sky as part of a worldwide weather modification program. Dubbed "chemtrails" by observers, the aerosols are thought to be a brew of aluminum and heavy metal oxides harmful to both the environment and human health. Although the Pentagon and other federal agencies claim that chemtrails do not exist, the technology behind them is described at length by many spray patents on file with the U.S. Patent Office. Several are held by Raytheon, the country's fourth largest defense contractor and top provider of weather monitoring equipment for the National Weather Service. Activists claim the program, which remains undisclosed to the public, is altogether different from the practice of cloud seeding to stimulate rainfall. To the contrary, aerosol spraying seems better suited for causing drought. In particular, one of its core design features is to stop normal clouds from condensing into precipitation. When that happens, an enormous sea of vapor is corraled in the atmosphere, then diverted to some far-flung location using other weather modification tools. Eventually that water will fall, but not necessarily as part of a typical weather system. In the past twenty years, ark-like deluges, freak hail storms, "snowmageddons" and mile-wide tornadoes have become commonplace events reported on the evening newscast. That's led some chemtrail opponents to brand this phase of the secret program weather warfare. And they claim the U.S. Air Force is directing it all from behind closed doors. So far, the mainstream media and even the editors at Wikipedia have promoted the U.S. Air Force position that anyone who believes in chemtrails is the victim of a conspiracy theory. But if a picture is worth a thousand words, these two DVD's may be the Mona Lisa that puts the matter to rest. Produced by G. Edward Griffin, Michael Murphy and Paul Wittenberger, the films feature scientists, retired USDA employees, farmers, a strategic weapons consultant, military historian, investigative journalist and even a former TV weatherman. Together, these folks paint a chilling picture of a covert campaign to engineer the weather engineer the weather and in the process cripple the planet for generations to come. The films also explore the quest by some agribusinesses to eliminate non-GMO farms using weather disasters, and a new stock market product called weather derivatives, which allows investors to bet in advance on the time and place of those disasters. So what are chemtrails, anyway? First of all, the phenomenon is not to be confused with normal airplane contrails. 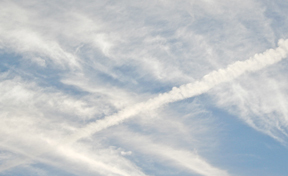 "Con" refers to condensation from water vapor exhaust emitted by jet engines in cold air. That leaves a trail behind the plane that rarely lasts more than a minute. A chemtrail is something much different. According to those interviewed in the films, vaporized aluminum, barium and strontium (among other ingredients) are pumped into storage tanks onboard specially-equipped aircraft. These planes are then dispatched to specific destinations and disperse the chemicals via dispensers mounted on the wings and/or tail. Aluminum oxide and/or other compounds may also be added to a jet's fuel supply and emitted from the engine to generate a different type of chemical reaction. In most cases, when the onboard concoction makes contact with the air, the metals oxidize, generating nano-sized particulates that can remain aloft in the sky for up to 20 hours. If there are natural clouds nearby, the nanoparticles will latch onto that water vapor to preclude the possiblity of precipitation. Although it's extremely toxic, barium is included in part to provide a whitening effect on the chemical brew. This disguises the metallic signature and gives a more cloud-like appearance to the emissions. 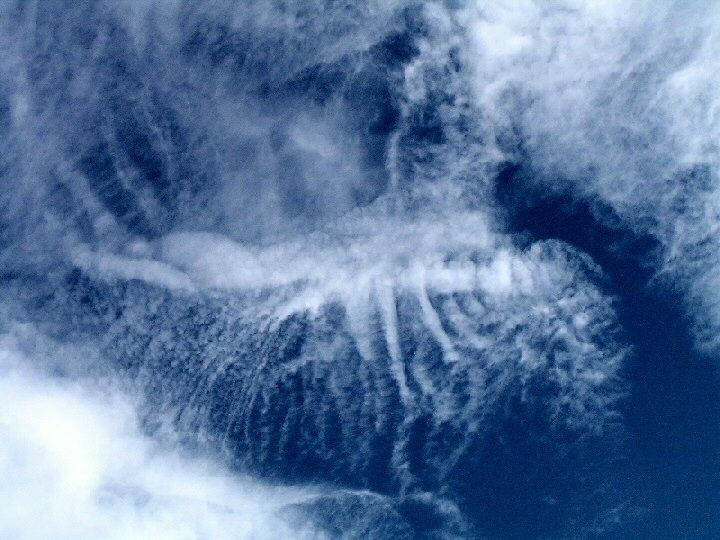 Chemtrails are initially distinguishable by their elongated formations or gridlike pattern in the sky. However, as the particulates spread out, these formations become either wispy fragments of artificial cirrus, or a smog-like murky haze. 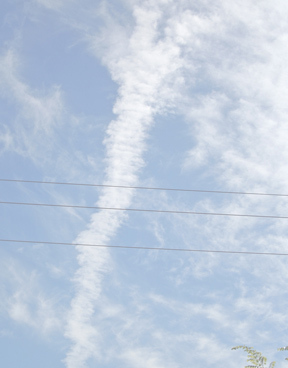 Other indications of spraying include small rainbow-like halos appearing in the clouds, the absence of morning dew, and radio signal interference. "So many things I would have done, but clouds got in my way..." What do you suppose Joni Mitchell's thinking now when she looks up at the sky? The iconic musician is afflicted with the mysterious Morgellon's malady, which Mitchell describes as a "terrorist's disease". Photos: TheCityEdition.com. Although chemtrails have been sighted over many states and foreign jurisdictions, the sprayings are especially prevalent in the Pacific Northwest and perhaps heaviest around the Aleutian Islands and Alaska. A former TV weatherman, Scott Stevens, and military weapons consultant Mark McClandish explain in the films that the West Coast is targeted in order to sequester water vapor from fronts coming off the ocean. In fact, the timing of the alleged Air Force program has coincided with the exceptional drought in California and massive deforestation underway here. At the Consciousness Beyond Chemtrails conference in 2012, Stevens said he began tracking what he calls "persistent trails" from his Southern Colorado home about ten years earlier. The weatherman recounted that on some days multi-colored plumes would spew from the tail of large jets. But on other days, smaller twin prop planes seemed to be conducting "mark and surveil" missions using much thinner trails. The twin props would then emit short puffs of aerosols in order to mark points where the continuity of a trail had been interrupted. Stevens surmised that the objective of these flights was to generate data about atmospheric energy that could be fed into real-time weather modeling programs. He later examined satellite imagery of past storms and hurricanes and noticed many anomalies in the cloud patterns and storm tracks. In particular, weather systems were frequently hinged to a rectangular "hole" that appeared during the progression of the front. Since fluid dynamics precludes water vapor from maintaining 90-degree angles, the former weatherman said there was no question that weather modification had been implemented to influence the storms. "They use these holes to swing the storm around these anchor points [at the four corners]," he told the audience at the conference, aided by Powerpoint images and video. "There is some resonant geometry waves they can establish in the atmosphere that can enhance the strength of hurricanes." He also thought weather modifiers might be using cymatics to determine the correct frequencies for pulsing radio waves into the clouds. And in the same manner that a storm could be steered and enhanced, Stevens said he'd watched storms in the west repeatedly dispersed with the help of aerosol spraying. Showing a time-lapse video of one episode in Colorado, he explained, "They resonate these storms until they lose their charge... As these particles are put into the clouds we have what is called an icing out situation". Essentially, the updraft falls apart, causing raindrop production to collapse. Clouds photographed by Scott Stevens. At left, a mark-and-surveil mission in progress. 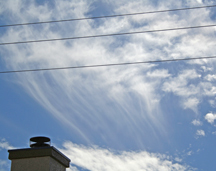 The other photo shows a bank of chemtrail-influenced clouds dispersed with RF wave pulsing. Of course, any aerosols sprayed aloft will at some point descend to the ground. Rosalind Peterson, a former USDA crop-loss adjuster, and retired USDA biologist Francis Mangels explain in the films that the fallout of metal oxides has had dire consequences for Northern California. Both point to a hefty spike in soil pH that has sparked a die-off of species. Micro-organisms essential to nourishing plant life are disappearing, for instance, which in turn jeopardizes the survival of the plants and trees themselves. Peterson checked records kept for the state's watersheds, uncovering high concentrations of metals showing up after 2000, around the time chemtrailing first got underway. She subsequently investigated the alarming rate of tree decline with the help of former California Dept. of Fish and Game biologist Allan Buckman. "Once you have air pollution and add aluminum," Peterson writes, "it allows the tree roots to uptake the aluminum, which then prevents the roots from absorbing water and nutrients to survive. This leads to death which looks like drought." For his part, Mangels has measured numerous soil and water samples over the last several years -- including a lined pond near his home in Redding, California -- and turned up the same chemtrail signature of aluminum oxide, barium and strontium found in the water records. Even more disturbing, measurements of the snow pack on Mt. Shasta revealed an increase of aluminum many times the permissible rate established by the EPA. At any rate, as those moisture-laden, artificial clouds get ferried across the Continental Divide on the jet stream, the next step for weather modifiers is to steer this airborne lake to a specific location. But how is the steering accomplished? Scott Stevens had seen enough satellite imagery to suggest that "the entire planet is wrapped in an electromagnetic girdle," but wasn't sure where the radio-frequency (RF) wave pulsing was originating. Some activists have speculated that the nationwide NEXRAD doppler radar system may be covertly equipped to pulse the sky. The 150-station weather monitoring network was initially approved during the Reagan Administration's push for a "Star Wars" missile defense system back in the 1980's. Interestingly, NEXRAD became embroiled in a public debate over secrecy issues during the course of its development, followed by a long delay in construction. In the 1990's, a group of California residents led by actor Larry Hagman sued the U.S. government over the placement of a NEXRAD station near their homes. The group claimed that EMF radiation emitted by the radar's microwaves posed a serious health hazard (not unlike that posed by cell phone towers today). Nick Begich, Jr., son of the late Alaska congressman of the same name, explains in Why in the World are They Spraying? that the U.S. Air Force has been using a technique called ionospheric heating to perturb the atmosphere for the past 30 years. It all began with a strange array of antennas erected in Begich's home state, called the High Frequency Active Auroral Research Program (HAARP). To do this, a high-energy radio frequency beam is generated by the array in order to heat part of the earth's ionosphere. This causes a wide swath of hot air to rise, which in turn creates a vacuum for cold air to rush in below it. This perturbance is enough to disrupt the course of the jet stream as it subsequently moves down through the Lower 48 states. The general idea of high-intensity RF beams (or rays) was first proposed by the electrical genius Nikola Tesla in the early 20th century, and later patented by physicist Bernard Eastland. According to the patent, "[W]eather modification is possible by, for example, altering upper atmosphere wind patterns or altering solar absorption patterns by constructing one or more plumes of atmospheric particles which will act as a lens or focusing device." Even the course of the country's jet stream can be altered, according to Begich, who wrote the 1995 book Angels Don’t Play This HAARP. 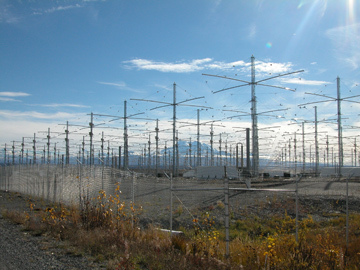 HAARP was run by the U.S. Air Force until 2015, when the University of Alaska Fairbanks took control of the facility. University officials say HAARP will continue to function as an experimental project for researchers, including those working on military projects. A second facility is up and running in Puerto Rico, and a third is alleged to be secretly operating elsewhere in Alaska. Known HAARP-like stations operate in Northern Scandinavia (EISCAT) and at Russia's Sura Ionospheric Heating Facility. A fifth location is rumored to be pulsing clouds over the Pacific Ocean from Isla Guadalupe, situated 150 miles west of the Baja peninsula. 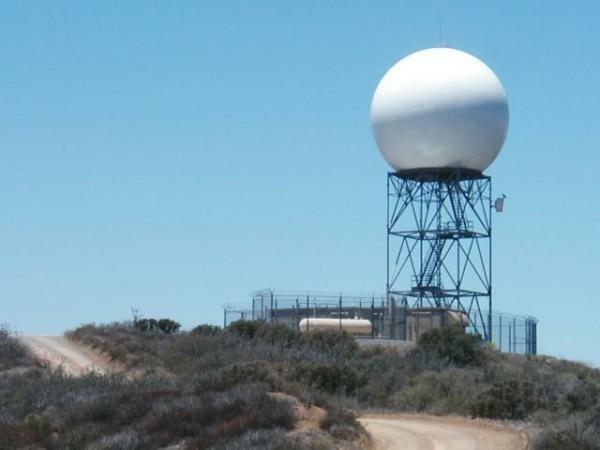 At the top, a Nexrad doppler weather station in Corona, California. Below it, the much publicized HAARP facility in Alaska is still in operation, but no longer controlled by the U.S. Military. Photo Credits: NOAA, Michael Kleiman, U.S. Air Force. Suffice to say, whichever scheme is deployed to pulse the sky, the end result tends to be really bad weather. Weather modification technology also appears to be available for manipulating (or even generating) hurricanes in the Gulf of Mexico. 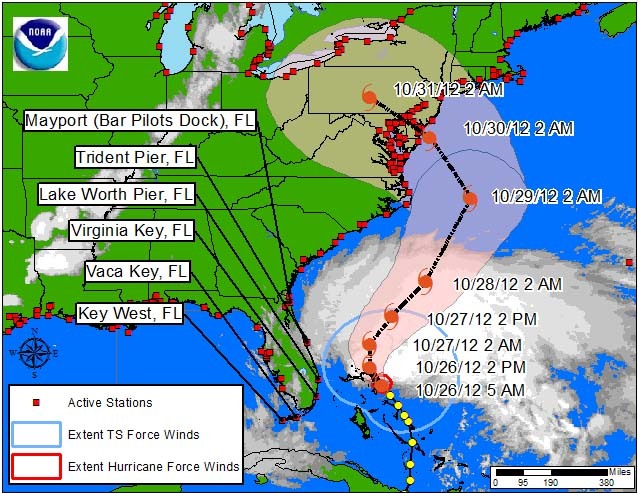 Activists say Hurricane Sandy's sharp left turn towards New Jersey in 2012 is one example of weather warfare in action. The physics-defying turn of the hurricane was precisely identified within a couple miles of its landfall by British forecasters, as a Nor'easter barreled across New England to meet it in Atlantic City. The disaster occurred shortly before the 2008 presidential election and was credited by many for Obama's come-from-behind victory. The event likewise resulted in a big payday for then New Jersey Governor Chris Christie, who was later accused of diverting millions of dollars in FEMA payouts to advance his own political ambitions. Setting so much circumstantial evidence aside, it's perhaps not surprising that officials from the U.S. Air Force and the National Oceanic and Atmospheric Administration (NOAA), which manages the National Weather Service, steadfastly deny that they engage in weather modification to cause natural disasters. According to a 2001 fact sheet (PDF) jointly issued by the EPA, NOAA, FAA and NASA, what conspiracy theorists identify as chemtrails are really just "persistent contrails [that] often evolve and spread into extensive cirrus cloud cover that is indistinguishable from naturally occurring cloudiness." In addition, the grid-like, tic-tac-toe appearance of the trails that many people see simply reflects ordinary flight patterns of commercial and military air traffic. And there was more obfuscation to come. In November, 2016, three scientists with the Carnegie Institution for Science at Stanford teamed up with the founder of the website Metabunk.org, Mick West, to conduct and publish a survey in the journal Environmental Research Letters. Calling to mind the old Crest toothpaste commercial that boasted "four out of five dentists surveyed recommend...", the authors stated "Results show that 76 of the 77 scientists (98.7%) that took part in this study said they had not encountered evidence of a SLAP." SLAP stands for "Secret Largescale Atmospheric Program", a term invented by the survey team. Following publication of their findings, a host of media outlets, from the Smithsonian Magazine to Huffington Post, jumped onto the SLAP bandwagon and heralded the survey as evidence that chemtrail opponents were wrong. The Huff piece even labeled them "chemtrail truthers". The New York Times joined the fray as well, neglecting to mention that the Carnegie Institution is a major funder of stratospheric aerosol engineering, the science behind chemtrails. Besides that, less than 17 percent of the 465 scientists handpicked to participate in the survey responded to the invitation. Unimpressed by official denials that a spraying program was taking place, former Rep. Dennis Kucinich of Ohio included a chemtrail ban in the first version of a 2001 bill known as the Space Preservation Act. Kucinich was later persuaded by colleagues to drop the chemtrail reference in order to advance the bill to a vote, but the legislation never reached the floor of the House. A short time later, the city councils of Berkeley and Richmond (both in Northern California) passed nonbinding resolutions to ban chemtrails. Other local government agencies in the West have not been as quick to step up to the plate. In response to numerous citizen complaints, a state environmental official in Arizona told a town hall-like meeting that the sky laid outside her agency's jurisdiction. To which one citizen responded, "We are being sprayed like we're bugs, and it's really not OK." Meanwhile, representatives from the California counties of Siskiyou and Shasta have refused the persistent pleas of area residents to test the air and water for metal oxide contamination. In Shasta County, public hearings were held in 2014 to learn more about chemtrails, but no subsequent action was taken. Of course, anyone who follows the trendy science of geoengineering knows all about weather modification and atmospheric aerosol spraying. Noted academics in the field routinely discuss and publish papers about the techniques which the U.S. Air Force and other agencies claim are a figment of the conspiracy theorist's imagination. Professor David Keith of Harvard University even published a book on the subject, A Case for Climate Engineering in 2013. He later appeared on The Colbert Report to promote the idea. So maybe chemtrails are not a hoax after all. As for the sulfates Keith talks about in his book, they're not what shows up in soil and water tests. 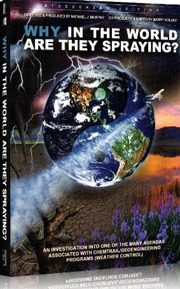 In What in the World are They Spraying?, Keith is seen addressing a scientific conference in San Diego three years before his book release, stating that aluminum is a far better choice for spraying because of its more advantageous chemical properties. During a Q and A at the same conference, Keith was asked by Dane Wigington of the advocacy group Geoengineering Watch about health risks associated with dispersing aluminum into the air and allowing it to accumulate on the ground and in drinking water. Keith claimed that he and his peers had yet to conduct any studies which might answer that question.